The Italian University System is organized in 3 cycles: 1st cycle degree (laurea), 2nd cycle degree (laurea magistrale), 3rd cycle degree (Research Doctorate - PhD). 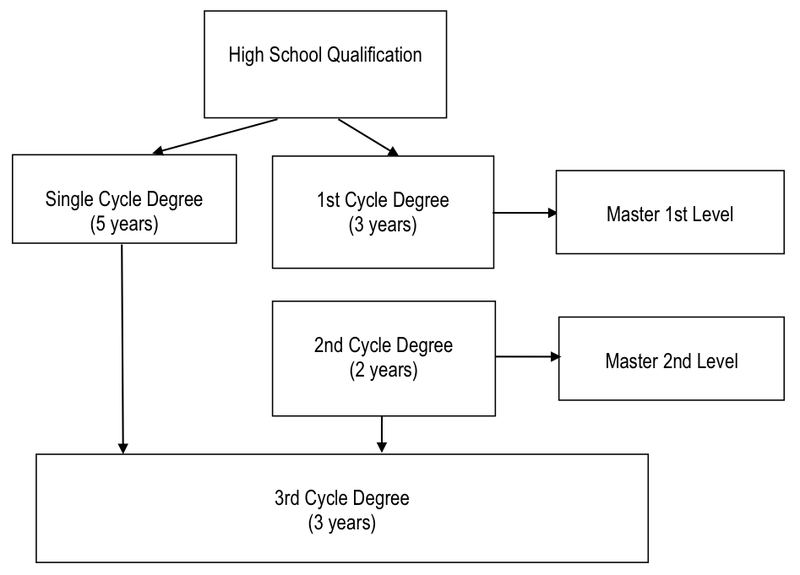 Qualifications awarded at the end of each cycle give access to the next cycle. Graduation marks are expressed in marks out of thirty. The exam is passed if a mark of at least 18/30 is achieved. The maximum mark is 30/30 with the attribution of the first class honours. The comparison between the ECTS grading scale and the Italian grading scale provides an instrument to interpret grades awarded to ECTS students, and as such facilitates credits transfer. European Credit Transfer System (ECTS) is a standard for comparing the study attainment and performance of students of higher education across the European Union and other collaborating European countries. ECTS credit is one Italian CFU (“credito formativo universitario”) and it’s the unit to measure a student’s overall effort. 1 CFU is 25 hours, including individual study, lessons, traineeship, seminars. One academic year corresponds to 60 ECTS credits equivalent to 1500 hours of study.